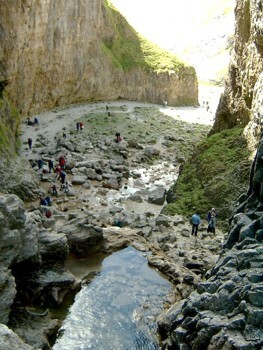 Walking Routes visiting Janet’s Foss, Gordale Scar and Malham Cove. As to be expected on a sunny May Saturday the area around Malham, an attractive little village in the Yorkshire Dales, was busy. 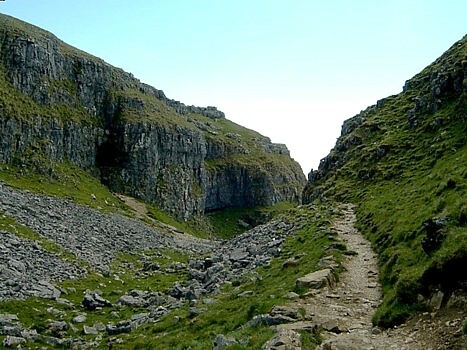 However, the paths taken with Anne and our eldest son Greg to the famous Malham Cove were comparatively uncrowded and were delightful but, in parts, quite rugged. 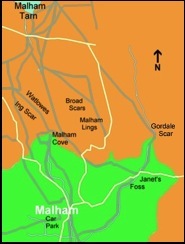 Click for large version of map and route options. 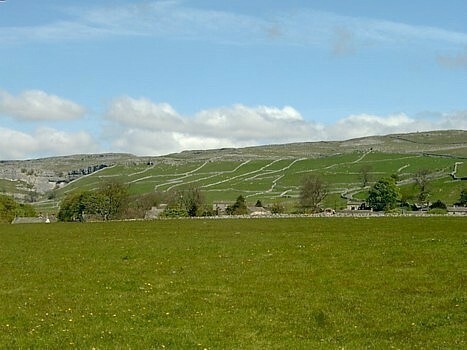 From the National Parks Car Park, located to the south of Malham, we walked towards the village. However, before the centre of the village was reached, probably less than 100 yards from the car park, we crossed a bridge over a stream located to the right hand side of the road (east). From here we followed a path (the Pennine Way) south, with the stream on our right, but after only a 100 yards or so turned left on another path away from the stream and the Pennine Way. 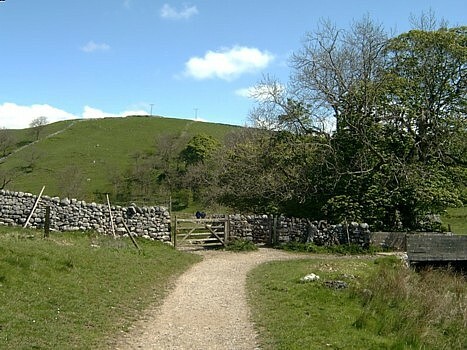 This path, which was generally in very good condition, took us through pastureland but always, not far into the distance, were the limestone uplands which we had come to walk. 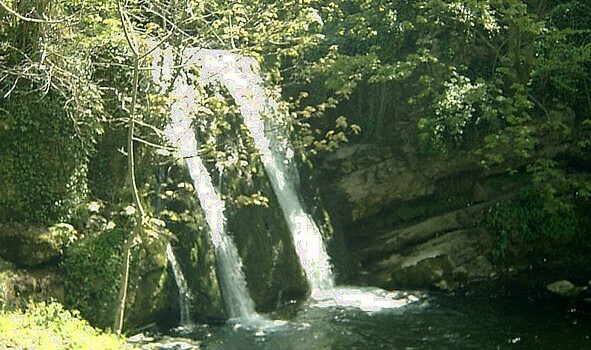 After just over one mile we came to a wooded area in a small ravine of a valley, part of the National Trusts Malham Cove Estate, signposted as being Janet’s Foss. 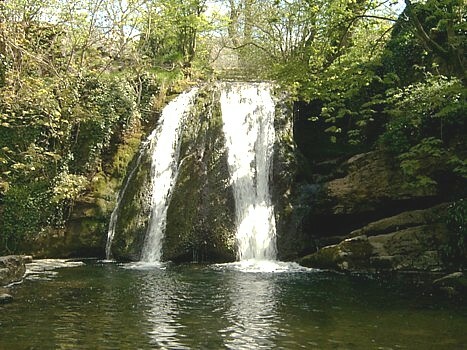 Evidently Foss is a Dale’s word of Scandinavian origin for a waterfall and Janet was a good fairy who inhabited these parts and lived in a hole by the falls. 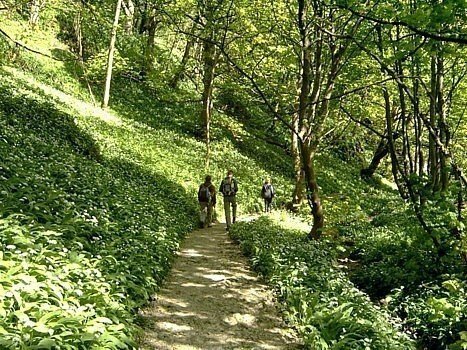 She certainly picked a beautiful spot particularly if she was “into” wild garlic as this wooded valley was covered with these plants. 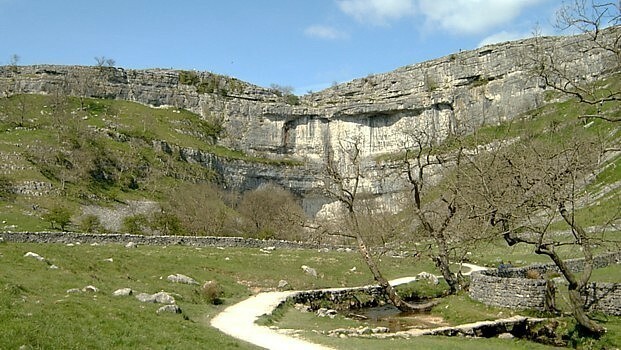 Having admired the falls we continued along the path and soon reached a minor road that went back to Malham. 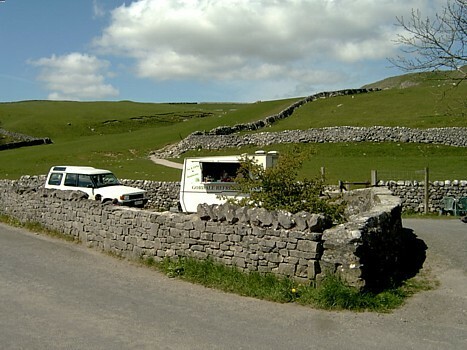 Here we turned right heading away from Malham and, having soon passed a caravan “eatery” in a layby, turned left off the road into a camping site. Following the direction sign and the obvious path, with a stream on our left, we headed for an initially V shaped, valley whose sides gradually became steeper and steeper until it became a spectacular gorge. 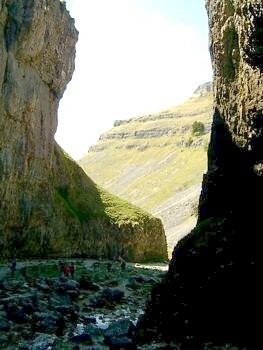 This was Gordale Scar, a wonderful example of the power of water. 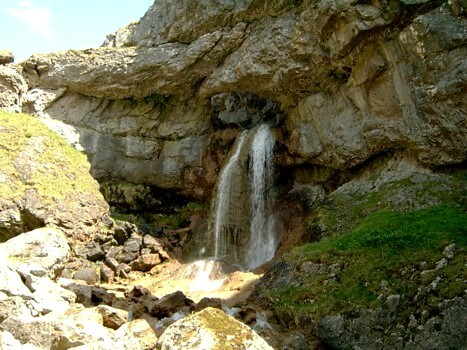 The gorge was originally a cave but, thanks to the impact of water at the end of the ice age, the roof collapsed leaving behind this magnificent monument to erosion. We spent some time here “admiring” the rock climbers dangling from the cliffs and watching walkers scrambling over a rocky route to the left of the waterfall, which cascaded into the gorge. 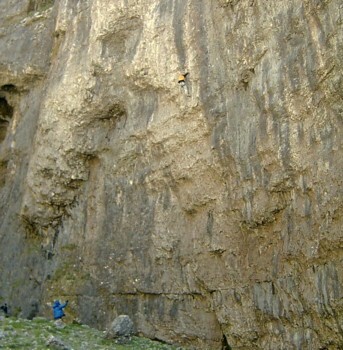 Initially we had all intended to climb over this “scramble” but when Anne attempted it she was unable to move her right arm high enough as her shoulder had been “playing up”. 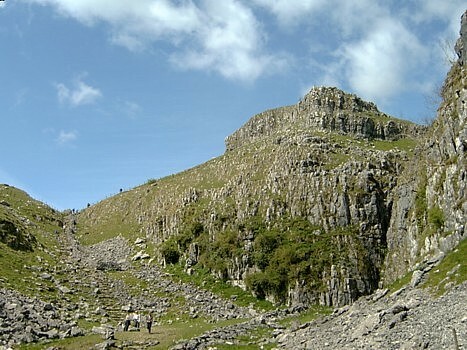 I think she was also put off, like many other people, by a man who spent in excess of 10 minutes lying prone across the route, making it difficult for other walkers to get round him. He was still acting like a limpet on the rocks when I passed him after we decided that I would do this scramble by myself while Anne would go with Greg, who had done the Scar before, via a less troublesome path. 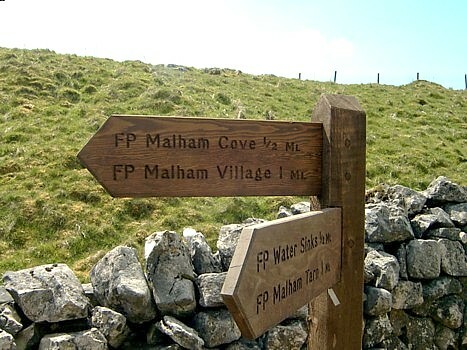 There route would take them back to the caravan “eatery” then via a path, to the road from Malham to Malham Tarn and I would meet them just south of an area called Malham Lings. Once on top of the difficult part of the scramble, which probably took less than 2 minutes to complete – it was actually a lot easier than it looked – I took some photographs looking down towards Anne and Greg and the base of the gorge and also of the hole (eye) higher up the gorge that the water gushed out of. Very impressive. From here the route was straight forward. 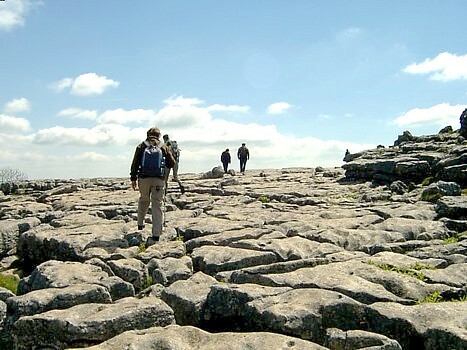 Having climbed up some limestone steps I reached the top of this limestone plateau landscape, which had some wonderful limestone pavements. 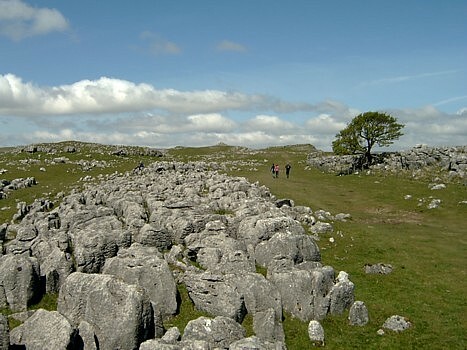 From here our route was just west of north, and in less than ½ mile, where the path split, we took the left fork and were soon walking to the north of an area of limestone pavements called Broad Scars. 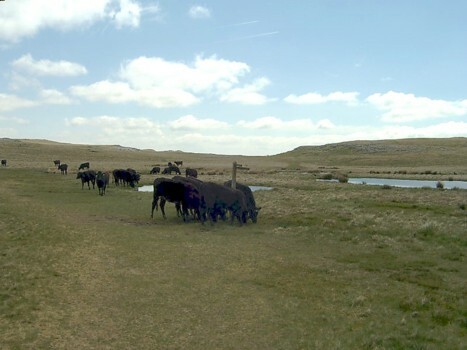 Along this part of the walk we glimpsed Malham Tarn before, having given a wide birth to some cows congregating by a small pool, we reached the Pennine Way. 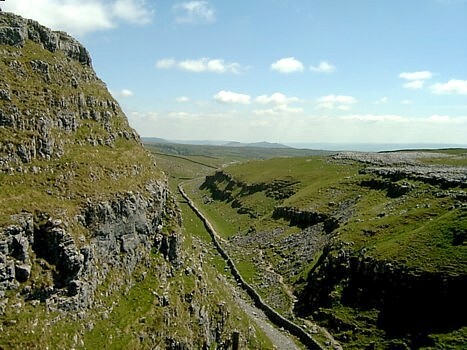 Our route now followed the Pennine Way southwards and soon we were walking through a rugged valley following a path that gradually ascended, taking us away from the valley bottom on to its right flank. With the sun shining this was a very enjoyable part of the walk. As the path took us higher up the side of the valley it also started to bend to the right and suddenly as I looked down I realised we were approaching the end of what I think can best be described as a hanging valley. If we had stayed at the lower level we would have reached a substantial drop in front of us. 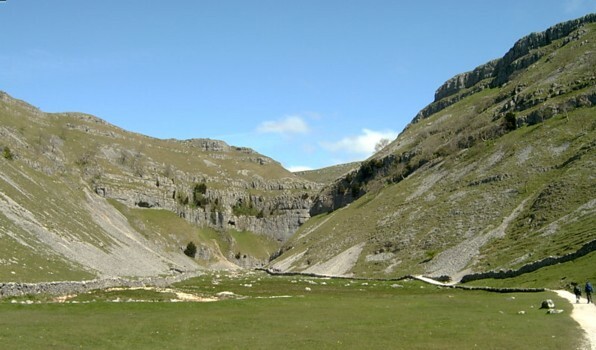 However, our path having turned right did a sharp change of direction left and we descended a limestone staircase to a valley, below the hanging valley, between hillsides called Ing Scar Crag to the south west (Ing Scar on my maps) and Watlowes to the north-east. 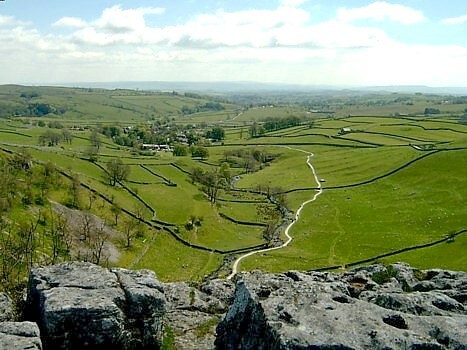 We followed this valley for slightly more than half a mile and then it broadened out and on our right was the spectacular limestone pavement on top of Malham Cove. 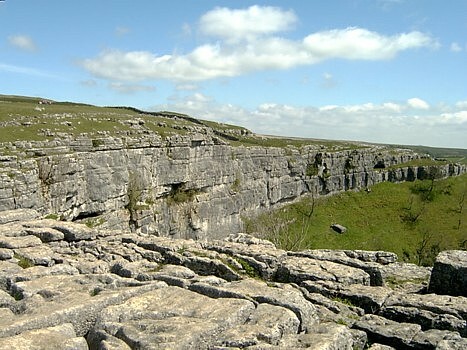 As to be expected there were quite a few people on top of Malham Cove, but certainly less than I had expected. 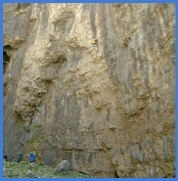 It is quite a pull from the base of the Cove to its top. But the views from the top, like the pavement, are impressive. It is difficult to describe it in words but hopefully the photographs I took will help to convey the magnificence of the area. Needless to say Anne warned both Greg and me not to get too near the edge and although Greg and I were unworried about walking over the pavement Anne was a little nervous about missing her footing and stepping into one of the pavement cracks. 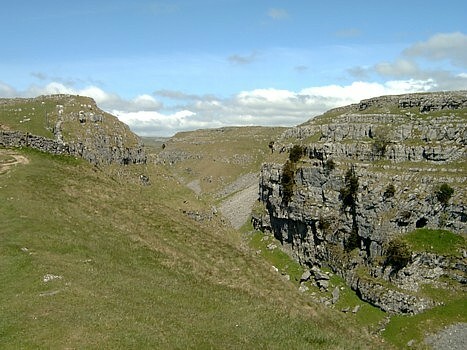 Photographs taken along the Pennine Way to the top of Malham Cove. 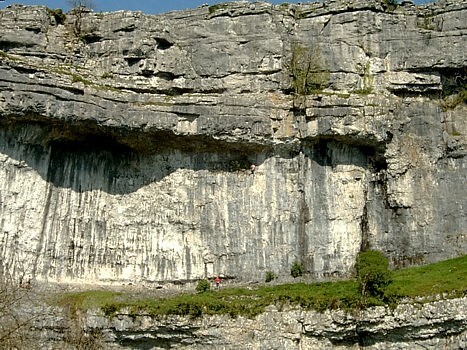 Having spent some time on top of the Cove, with Anne exploring between the pavement cracks for plants, we followed the stepped limestone descent to the base of the Cove and for a short time watched climbers tackling routes on its almost sheer face. We left the base of the Cove with the stream on our left, which flows from the base of the Cove having seeped through the porous limestone from further up the hillside. 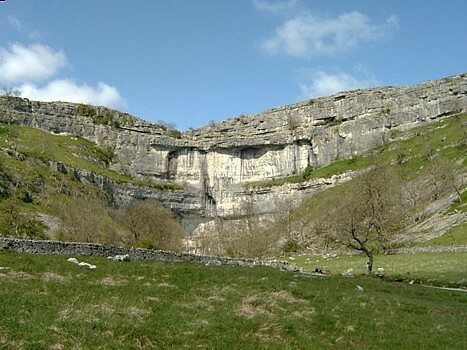 From here we continued along the Pennine Way, through Malham Village, which I thought surprisingly unspoilt in view of the number of visitors it gets, and were soon at the Car Park. 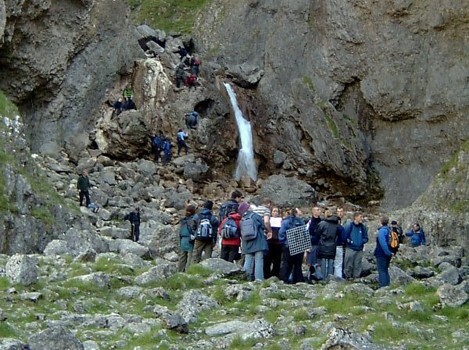 It had been a really enjoyable walk with such spectacular scenery. 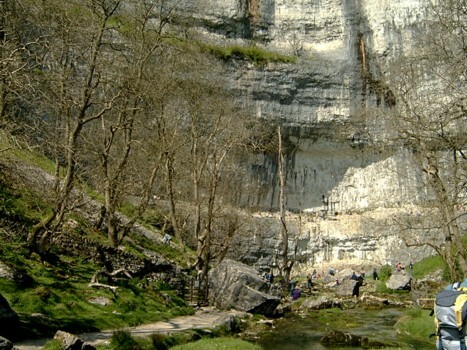 Photographs taken at, or near, the base of Malham Cove. The total distance I walked I estimate as being 7½ miles, with Anne and Greg’s route, and the intended route, being probably a fraction of a mile less. 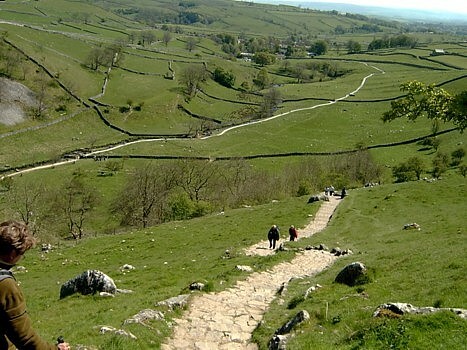 The Ordnance Survey Map that covers the area of this walk is the Explorer Map for the Yorkshire Dales – Southern and Western Areas - reference OL2.